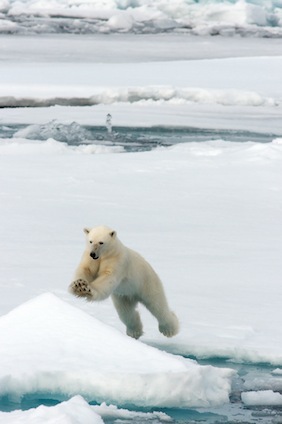 There are certainly many myths out there about the mysterious polar bear. Therefore it can be confusing when you try to determine what is fact and what is fiction. These polar bear facts will help you to get on the right track with that information. It is important to remember that just because you read something online, that doesn’t make it a fact. Did you know that polar bears are the largest carnivores in the world that reside on land? They also are one of the largest land predators in the world, sharing that top spot with the Kodiak Bear. Polar Bears give birth to their young on land, but then they spend most of their time in the water. Most people assume that they are mainly land animals but that isn’t true. It is due to the fact that they spend so much time in the water that they are classified as marine mammals. There are 19 different subpopulations of Polar Bears that have been identified and categorized by researchers. Right now 8 of those subpopulations are categorized as vulnerable due to the decline of their overall numbers. The biggest threat to the survival of Polar Bears is global warming as it is removing their natural habitat. Polar Bears are solitary animals other than when they are ready to mate. Did you know that they occasionally have been found to mate with Brown Bears? Genetically, it has been proven that they diverged from the Brown Bear more than 150,000 years ago. This could explain why there is still an attraction there when it comes to mating. There is a great deal that we don’t know about Polar Bears. They remain such a mystery because of the remote locations where they live. Many of them are in extremely cold regions where it is virtually impossible for humans to survive. It is estimated there aren’t more than 25,000 Polar Bears remaining. They are able to fast for several months at a time during the colder part of the year when food is scarce.This is a natural ability that they can put into motion when they need to for survival. Only the pregnant females hibernate with the others and all of the males remaining alert all year long. The claws of Polar Bears are shorter than other bears so that they can easily dig in the ice. It has long been a myth that all Polar Bears are left handed. Scientists don’t back up this claim yet it seems to be one of those issues about these bears that won’t go away. They use both of their claws to dig with and both of their hands to capture prey with. How do Polar Bears stay warm in these very cold climates? They have layers of fat under their fur called blubber. These layers serve as a type of insulation for them to maintain their body temperature. This is why when you see Polar Bears at a zoo in a warm location they are much thinner. They no longer need to produce those layers of blubber for their protection. The amount of blubber present will depend on the climate as their bodies are easily able to adjust. There are plenty more great Polar Bear facts out there to explore. Learning them can help you to further understand this very interesting and isolated type of animal in the world. Perhaps it will also fuel your desire to help them to continue being on Earth through conservation efforts and personal changes you can make for the environment.